Looking to buy any Dry Fruit Collection by the Brand of Cadbury? 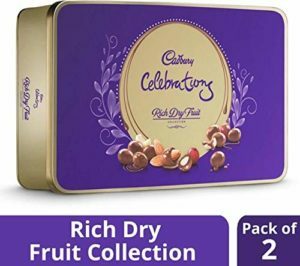 Now Buy Cadbury Celebrations Rich Dry Fruit Chocolate Gift Box, 177g (Pack of 2) at Rs 500 from Amazon. Each box contains almonds, cashews and raisins enrobed in rich chocolate. So, hurry up!! How to Buy Cadbury Celebrations Rich Dry Fruit Chocolate Gift Box, 177g (Pack of 2) at Rs 500?